Last December my lovely boyfriend bought us a dessert cooking class at a place downtown Chicago called The Wooden Spoon. 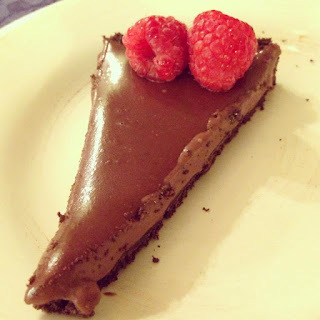 In the class we learned how to make this amazing chocolate tart and since then I've made it on several occasions. This past weekend I made it for the first time for my family for Mother's Day. It is a surprisingly simple recipe and will wow a crowd. You will need a 10 in removable-bottom fluted tart pan. 1. Heat oven to 350 degrees. To crush graham crackers, put through food processor. Add melted butter and pulse until moistened. 2. Place tart pan on a rimmed baking sheet and press graham cracker mixture into the bottom and up the sides of the tart pan. 3. Bake tart crust for about 10-12 min until dry. Take out of oven and let cool. 4. In a medium saucepan, bring the cream to just a boil. Remove from heat and whisk in chocolate until smooth. 5. Pour chocolate mixture into tart shell and refrigerate for at least one hour, until set. 6. Sprinkle with toppings before serving. Toppings: In our class we made the tart with toasted hazelnuts and flaky sea salt. Hazelnuts are expensive so the past few times I've used just sea salt or fresh fruit like raspberries. Next winter I plan on adding peppermint. Note: This is easily made gluten free if you crush up gluten free chocolate cookies.